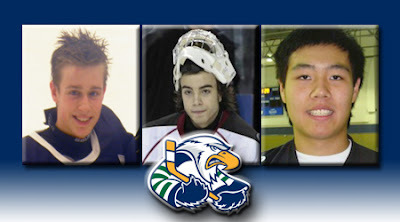 Surrey, BC - The Surrey Eagles Hockey Club is pleased to announce that defenseman Austin Edwards ('95), forward Chris Seto ('97) and goaltender Bo Didur ('97) have committed to play for the team, beginning in the 2013-2014 season. "We're very excited that these three players have decided to play for us next season," said Eagles President, Head Coach and GM Peter Schaefer. "Austin is a really good puck moving defenseman while Chris is a skilled forward that had a great camp for us last year. Bo was very well liked by our previous goalie Michael Santaguida and had a great record last year as well. They're all great additions." Edwards, an Abbotsford native, appeared in eight regular season games and nine playoff games with the Abbotsford Pilots of the PIJHL in the 2012-2013 season. The 18-year-old had seven points in the regular season and six points in the post-season. Edwards has appeared in two BCHL games as well, suiting up for the Chilliwack Chiefs in the 2011-2012 season. "I'm really excited," said Edwards. "I've heard that the coaching staff is great. The Eagles have been a great team in the past, and with them coming off a berth in the RBC Cup, it'll be exciting to go there and play with guys who experienced that run." Seto spent the 2012-2013 season with the Cloverdale Colts Midget AAA team. The 16-year-old was a third round selection of the Kelowna Rockets in the 2012 WHL Bantam Draft. Seto, who is a Surrey native, also practiced with the Eagles throughout last season. "It will be a great experience to play in the BCHL," said Seto. "I wanted to play for the Eagles because I'm from Surrey, and practicing with the team last year really helped me a lot with my development. I'm really looking forward to it." Didur, who hails from West Vancouver, played for the Vancouver Northwest Giants in the BC Major Midget League last year. The 16-year-old net minder was part of the Giants squad that went to the Pacific Regional Finals before falling to the eventual Telus Cup Champion Red Deer Optimist Chiefs. "I'm really honoured to be given an opportunity to play for such a respected team in the BCHL," said Didur. "What the team accomplished last year was pretty amazing, and we hope to do what they did last year again this coming season." The Eagles would like to welcome Didur, Seto and Edwards to the organization.